My monograph on Votive Body Parts was published in Spring 2017. It was the culmination of work I did on my postdoctoral project at Cambridge University - a Leverhulme-funded collaborative research programme entitled Changing Beliefs in the Human Body. "This book examines a type of object that was widespread and very popular in classical antiquity - votive offerings in the shape of parts of the human body. It collects examples from four principal areas and time periods: Classical Greece, pre-Roman Italy, Roman Gaul and Roman Asia Minor. It uses a compare-and-contrast methodology to highlight differences between these sets of votives, exploring the implications for our understandings of how beliefs about the body changed across classical antiquity. The book also looks at how far these ancient beliefs overlap with, or differ from, modern ideas about the body and its physical and conceptual boundaries. Central themes of the book include illness and healing, bodily fragmentation, human-animal hybridity, transmission and reception of traditions, and the mechanics of personal transformation in religious rituals." 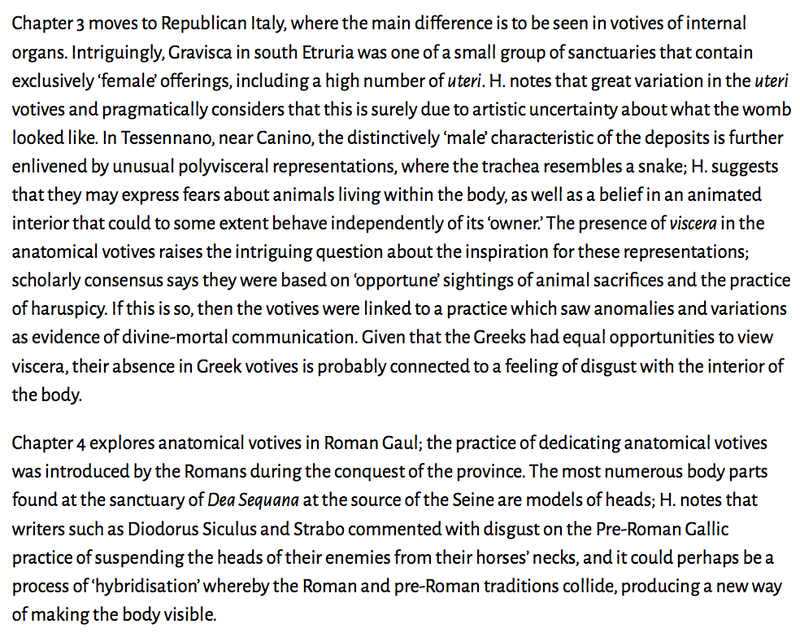 You can read sections of Votive Body Parts on the Google Books website. 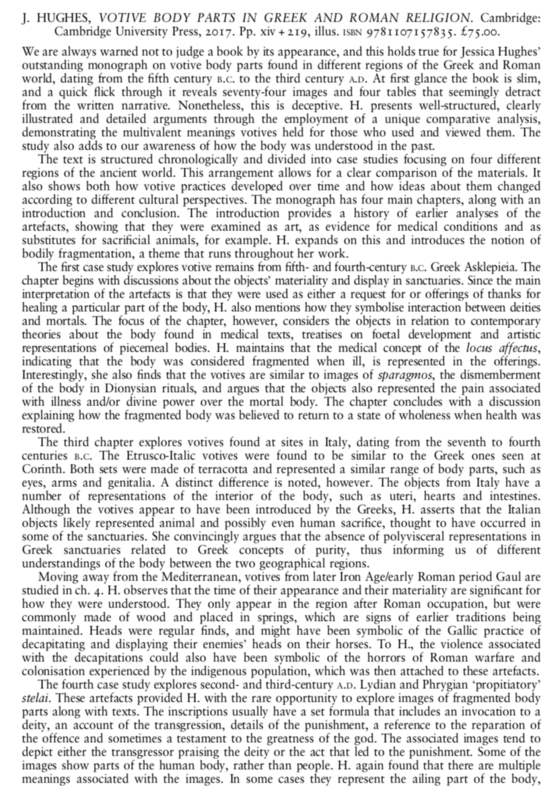 You can also access the text of a 2008 article 'Fragmentation as Metaphor in the Classical Healing Sanctuary', parts of which were reworked for inclusion in the first chapter of the book. World Archaeology magazine also ran a feature on the book, written by editor Matthew Symonds. I'm posting photographs of the magazine pages here, together with the book reviews I've seen so far. Sincere thanks to all the reviewers who took the time to read my book and publish their thoughts. Feature from World Archaeology magazine, by Matthew Symonds. Review by Cath Milnes for Classics for All (13th Feb 2018).